Five minutes into my interview with Emily Maitlis, high-profile broadcast journalist, Newsnight anchor, Cambridge graduate, fluent speaker of Spanish, Italian and French (with a workable grasp of Mandarin) and the Royal Television Society’s Network Presenter of the Year, we are talking about llamas. More specifically, we are talking about a llama safari walk in Peterborough she had booked to celebrate her birthday in September 2015 and the moment her editor asked her to cover the migrant crisis in Europe. She couldn’t possibly go, Emily said, because the tickets to the llama farm were already booked for her husband and two young sons. In the end, she flew to Budapest, delivered a piece to camera about the million refugees marching through Europe in search of a better life, while a line of riot police was forming behind her. After the broadcast, Emily got to bed at one in the morning, woke up two hours later and made her return flight at 5am, landing just in time to get to Peterborough for the llamas. It is, I will come to realise, a typical Emily Maitlis anecdote. She might take the news seriously, but she never falls into the trap of applying that seriousness to herself. ‘I have come to recognise it as part of the job,’ she writes in her book. ‘A protective layer that lets you carry on thinking about family plans for a Saturday afternoon when the whole world around you is falling apart.’ Airhead is, like its author, funny, wise, self-deprecating and insightful. Emily writes with just the right amount of gossipy acumen about her encounters with everyone from Donald Trump (‘makes things true by saying them’) to Simon Cowell (‘excellent at making other people feel important’) and Theresa May (‘shattered, sleepless and distraught’ after the Grenfell fire), and she reveals that no television broadcast is ever as slick in the preparation as it ultimately appears on screen. ‘What I tried to frame in the book is that sometimes it doesn’t go according to plan,’ she explains. Emily says that the one question she regrets not having asked was when she interviewed Bill Clinton in 2014 and failed to press him on his affair with Monica Lewinsky. The Newsnight crew had accompanied the former president on a charity initiative to India and had ended up on a goat farm in Lucknow in 43 degree July heat. Before filming, Clinton’s people had warned Emily that the president had just had ‘a funny turn’ and that ‘if anything happens on camera, we’re going to pull the tape’. It is a hectic job that requires a fair amount of domestic juggling. Newsnight airs every weekday evening from 10.30 to 11.15 and last month Emily, 48, was named as the new lead presenter of an all-female team. That means a lot of late nights with two children – Milo, 14, and Max, 12 – still at home. Her husband Mark Gwynne, an investment manager, is ‘very hands-on. He’s the best thing in my life.’ In the book’s dedication, Emily says that asking Mark to marry her – as she did on a beach in Mauritius 19 years ago – was ‘the best question I ever asked’. With such a high-pressure job, Emily tries, where possible, to eliminate unnecessary stress. She goes for an hour-long morning jog with her female friends when she can: ‘We run and we put the world to rights.’ She has a lean, runner’s physique and says she will always pack a pair of trainers in her ‘grab bag’, which contains the items needed for a last-minute work trip abroad. No, I say, utterly fascinated. Emily has always been a proficient traveller. Her father was the son of refugees from the Nazis, born in Berlin two weeks after Hitler came to power in 1933. When he was three, Emily’s grandfather got a teaching job at a university and was called in by the police who told him he was being denied the position because he was Jewish. ‘And they got out,’ she says. ‘So three-year-old Peter arrived [in London] with his parents. It was a refugee story, as so many of them are.’ Emily always wears a bracelet of interlinked chains around her left wrist made from a gold bangle her grandmother smuggled out of Nazi Germany. Emily’s father melted it down and gave a piece of jewellery to each of his daughters. Emily was born in Canada, where her father had gone for work, and raised Jewish (her husband is Catholic and her children are non-practising). She is appalled by the domestic resurgence of anti-Semitism. In 2018, anti-Semitic hate incidents in the UK reached a record high, and the Labour leader Jeremy Corbyn is engulfed in a row over his failure to deal with the issue in his own party. After Canada, her father got a professorship at the university in Sheffield, where Emily was raised. What was she like as a child? ‘I was very hyperactive. I did gymnastics – all those sort of things.’ Her first Saturday job was at Ross & Foster hairdressers in Sheffield where she was paid £6 a day. The salon offered her a full-time position but her parents told her she had to stay at school and she went on to read English at Cambridge. After graduating, Emily went to Hong Kong ‘on a whim’ and fell into a job in broadcasting, reading radio news bulletins for NBC. She stayed there for six years, before returning to the UK and joining Sky News as a business correspondent and then making the leap to the BBC in 2001. But the gender pay gap still exists and the BBC has come in for particular criticism over paying its female employees considerably less than its male stars. ‘We all knew about it [before it became public],’ Emily says. ‘But the BBC culture at the time was to think if women are unhappy, they can walk.’ I don’t think they ever said that to men. There was a sense that women would step into line.’ There was a sense, in other words, that women could like it or lump it, whereas the men were made to feel more valued. In the book, Emily reveals that her tactic for these awkward questions is always to leave them until last. It is mine, too, so I think she is expecting it when, towards the end of our hour together, I ask about the one thing she is understandably wary of discussing – her stalker. Last January, her university contemporary Edward Vines was jailed for 45 months for breaching a restraining order, having first been convicted of harassing Emily in 2002 and then being issued with an indefinite restraining order in 2009. In Airhead, Emily writes that Vines had befriended her in freshers’ week but they had stopped being close in the second term ‘and I was resented… made to feel I hadn’t explained why or what happened.’ She began to be ‘plagued by letters, phone calls, visits’ and this manipulative behaviour lasted for the best part of three decades ‘despite police intervention, a restraining order, prison sentences, warnings, mental health medication’. Her stalker was once even able to write Emily a letter from prison. Vines is now back behind bars. All Emily can do is to carry on living her life: going for runs, holding politicians to account, flying abroad at a moment’s notice, booking llama safaris for her birthday and refusing to let her children down. 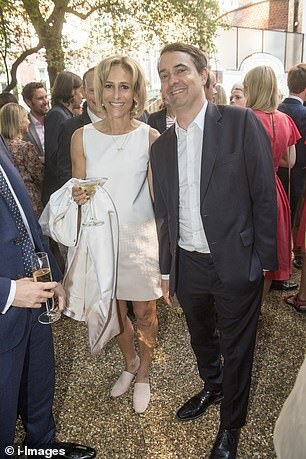 That’s who Emily Maitlis is: so much more than an autocutie and certainly not an airhead.